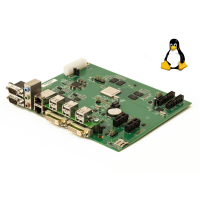 Featured on Linux Gizmos in February 2016, the Cortex-A15 based Titanium has been shipping since December 2015. Don’t be held back trying to use inconvenient development boards that don’t fit your case or your requirements. Read more in the product brief, or contact sales to receive a printed copy. Cortex-A15 motherboard based around the Texas Instruments AM5728. Starts up from U-boot 2015.07 preprogrammed into the on board boot flash, then loads Linux 4.1 with Debian 8.10 (Jessie) root file system. Each board includes a printed copy of the Quick Start Guide, a CR2032 coin cell, micro SD card, and 3 support tokens which can be used to ask technical support questions. Requires an ATX12V version 2.3 or later power supply, with 20 way Molex Mini Fit Junior mating connector. The power supply is turned on by a front panel push button, and can also be turned off by the same button or under software control. Please note that the SKU describes the revision 0.22 main board and revision 0.11 mezzanine board only, be sure to check that this is correct before ordering. Not all hardware features may be used or supported by system software. Description of the build system to build U-Boot and a Linux kernel suitable for deploying on the Titanium motherboard. The U-Boot and kernel repositories are similarly hosted by GitHub.